Since 2000, the trend has been toward ever increasing use of glass in school design because of the positive benefits it brings, including increased collaboration, better student performance and energy savings. 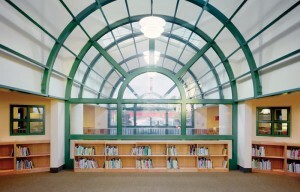 And, strategic use of safety and protective glazing helps improve school security. 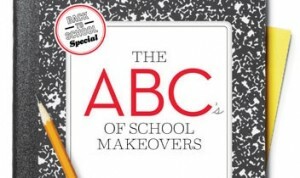 “An estimated 40% of the nation’s 100,000 public schools are in ‘bad to poor condition,’ according to Glen Earthman, Ed.D.,” a professor emeritus at Virginia Tech, reports Parade Magazine. Earthman has studied the link between infrastructure and student performance since 1993, and found that children attending schools in subpar condition score up to 10 percentile points lower on standardized tests, even after controlling for poverty. Schools are built to last. The average age among the nearly 100,000 U.S. public schools is 42 years. Schools under design or renovation today need to be performing for children entering school in 2050. How will students of the future learn best? The practice of basing decisions about physical space on research and data, or Evidence-Based Design (EBD), can help architects design schools that meet future needs. EBD is used extensively in healthcare architecture. Since EBD for schools is relatively new, rigorous data on which to base design decisions is a little difficult to find The one exception is a study conducted by Pacific Gas & Electric called Daylighting in Schools. The study analyzed more than 2,000 classrooms involving 21,000 students and the results were peer-reviewed by the Lawrence Berkeley National Laboratory. The study found that students in classrooms with large windows and skylights perform 7-18% better than students in rooms with little natural light. And, test scores improve even more if the windows are operable. 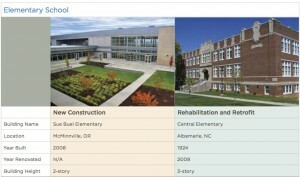 The National Clearinghouse for Educational Facilities (NCEF) recently completed a third edition of Educational Trends Shaping School Planning, Design, Construction, Funding and Operation. It looked 40 years into the future and tried to anticipate changes in teaching corps, school size and organizational structure of schools. Here are some of what NCEF found. School demographics. School age population will increase 35%. Student population will become more diverse, with the percentage of non-Hispanic white students declining from 52% (2010) to 35% (2050). The number of special needs children in regular classrooms is growing and has already increased nearly 40% in the last 20 years. Bigger campuses. If the current average school size is maintained, the U.S. will need 30,000 new K-12 schools by 2050. Finding funding for that many schools will be difficult. As a result, school size could grow despite parent pressure to keep schools small. Eco and technology innovation. 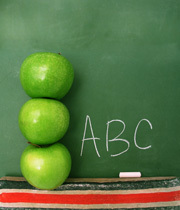 Schools are increasingly viewed as a key component in creating and maintaining a sustainable environment. Building eco-friendly schools cost 2-3% more than traditional schools, but over the long haul, green schools more than pay for themselves. Schools built in the last century had little choice but to rely on traditional wired glass for fire protection.Â It was one of the only fire-rated glazing options available. Unfortunately, traditional wired glass is not safety glass. In fact, wired glass breaks easily with minimal human impact. 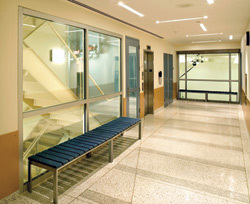 In 1977, traditional wired glass was given an exemption from meeting the Consumer Protection Safety Commission’s (CPSC’s) impact safety standard when used in doors, sidelites and other potentially hazardous locations because glass manufacturers claimed that they did not have the technology to make fire-rated glass that could meet the glass safety standards. 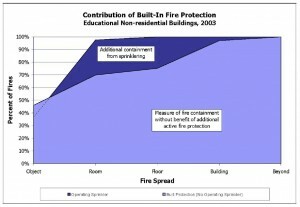 Today, there are safer, wire-free alternatives that provide both fire and impact safety. 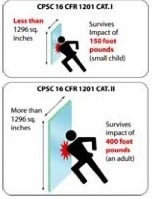 The International Building Code (IBC), was changed in 2003 to require that all glazing in potentially hazardous locations in educational facilities must comply with the CPSC safety-glass standards. In order to reduce liability and improve school safety are choosing to replace traditional wired glass with impact safe fire rated glazing. Learn more about the wired glass replacement program at Middlebury College. Main entry control. There should be one entrance at the front of the building for most of the day, and all visitors should be required to check in there. Operable windows in classrooms with inside labels indicating their use as an emergency escape. Measures should be taken to limit access from the exterior. Keep windows and place them strategically. Use clerestories and secure skylights in situations where windows may not work. Maximize sight lines within buildings. Make sure all corridors are well lit with natural, shared or artificial light. Remove any recessed dark areas. Add visibility in stairways. Provide sidelites adjacent to classroom doors. Intrusion resistant glazing to deter “smash & grab” forced entry. Two layers of glass bonded with an interlayer. Tested to UL 972 or ASTM F122. Ballistics glazing – designed to be bullet resistant for small arms (but not for high caliber rifles or bombs) Multiple layers of glass and interlayer. Tested to UL 752 or ASTM F1233. Blast resistant. Generally require a specialized security consultant.